The WaveEye is a particularly compact and versatile wavelength measuring device for cw or quasi-cw lasers between 450 nm and 950 nm. The measurement data is available with a data rate of 1 kHz without a warm-up delay. It can be used for an optical input power range between 0.1 µW and 1 mW. The digital measured value output is carried out via a USB connection, which also serves as a power supply. In addition, the wavelength information is available as a voltage of up to 4.096 V at the analog output. The WaveEye is particularly easy to operate via comfortable software or simple serial text commands. 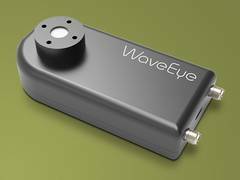 Due to its small size, the WaveEye is suitable as an OEM component for a variety of applications (e.g., in tunable lasers or as part of a larger measuring device).